I have several clients right now with young children, some already here on the island, others preparing to make a major move. Moving is not for the faint of heart. I think it is one of the hardest things to do . . . I have said many times that it aged me five years. One of the hardest things is watching your kids struggle through the transition. In the end, yes, I do believe it makes you stronger and more open to change, but during the transition, it is tough and help is good . . . below are some books I recommend, both for parents and kids. A typical home in the North Town Woods Neighborhood has become more affordable this year on Bainbridge Island. The neighborhood that was reaching for the $700,000’s in 2006 has now dipped to the low $500,000’s making the purchase of these home much more doable with a conventional or FHA loan. Good news for first time buyers. Don’t let the lucrative market dictate a buying decision if the time isn’t absolutely right. Potential homebuyers need to ask themselves if they have a good credit score, if their job is secure and if they can stay in the home for a few years. If the answer to these questions is “no,” it might make more sense to wait until life and finances are more stable. On top of a mortgage payment, there are several monthly fees and expenses any first-time buyer should consider when becoming a homeowner: insurance, property taxes, utilities and maintenance. Think about scaling back the home price in order to better budget for the entire package. A sizeable down payment is great to have for a home purchase, but not everyone can afford to fork over 20 percent upfront. Fortunately, there are many federal, state and local programs geared toward helping first-time homebuyers with down payments, interest rates and loan terms sure to make the whole process and affordability a bit easier. Buying a foreclosed or short sale home can be a risky proposition for a first-time buyer. Foreclosures are often sold “as-is,” while a short sale transaction can be lengthier and more complicated than a typical home purchase. First-timers should consult an agent or attorney with specialization in these areas. Obtaining lender pre-approvals are important because it establishes a homebuyer’s maximum purchase price, shows sellers that the buyer is serious about buying a home and lets the homebuyer compare interest rates and terms to find the best deal. One of the most important aspects of a home’s value is the neighborhood where it’s located. Even if the homebuyer does not have kids, buying a home near sought-after schools can help the resale value. Buyers using FHA-insured mortgages can apply their tax credit toward their home purchase immediately, rather than waiting until they file their income taxes to receive a refund. Prospective buyers who believe they qualify for the credit are also allowed to reduce their income tax withholding, therefore increasing their take-home pay. usively with a buyer’s agent so there are no possible conflicts of interest. Before buying the home, determine the property’s market value by having the realtor conduct a comparative market analysis. This report will show what buyers were willing to pay for similar homes in the area, giving a good idea of what will make a fair offer. Before signing on the dotted line, make sure to have a contingency plan in case things don’t go as planned in the home inspection or appraisal. If the home has a major flaw or doesn’t appraise for the purchase price, an escape plan allows the contract to be voided. The Growth Management Act of the early 1990’s set forth a number of requirements for incorporated municipalities. One very specific mandate was the encouragement of density increases in populated areas within municipally incorporated boundaries. One such manner in which to increase housing density with very little negative impact is the inclusion of Accessory Dwelling Units or ADU’s. 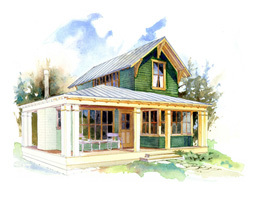 These modest buildings are typically adjacent to a main house and may be constructed on properties that accommodate water, septic and typical building system demands. These buildings typically range in sizes prescribed by local zoning ordinance. On Bainbridge Island this size may not exceed 800 square feet. 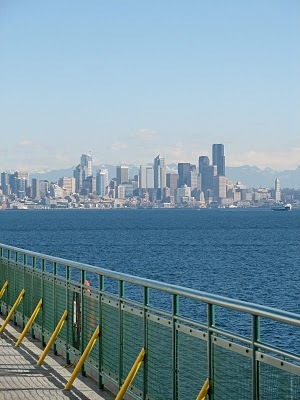 In Kitsap County and now in Seattle the maximum size is slightly larger at 1,000 square feet. These modest buildings are generally sustainable due primarily to the nature of their modest size and integrated fit within an existing built context. Additional sustainability measures may be incorporated such as heat recovery air exchange systems. Solar applications for both electricity and hot water and specifications for recycled building materials. Small houses offer a variety of dwelling choices for people who do not desire or can not afford larger housing. Many of the ADU’s that have been built on Bainbridge Island over the past decade have been above garage units. These spaces have been used in a number of ways including teenager hang­outs, in-home offices and guest houses. 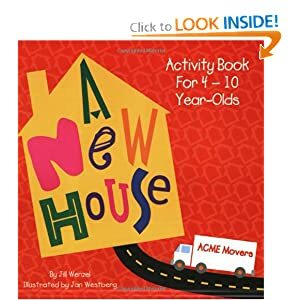 For those property owners who desire to age-in-place as many baby boomers are, these buildings can be occupied by a caretaker when the kids have moved on providing de-facto housing or as an alternative,extra income through rental. 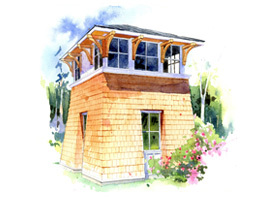 If a property is large enough and there are funds available, the simple concept of a house on an acre can evolve into a main house, ADU, separate carriage house and other support buildings. This collection of buildings located properly on the land fosters a sense of place and micro-community. A compound of buildings then sets the stage for multi­-generational use of a property. Multi-generational use of a property is important for connectivity of family history and origin. Many of the most compelling locations throughout the world have been based on this type of living pattern. Only in the last 100 years and primarily in the U.S. has this pattern been significantly eroded. As ADU’s are typically located on a contiguous piece of property, individual ownership becomes difficult. In some circumstances this has been solved by converting the ownership of the property into an LLC. Conversion allows another party to purchase shares of the LLC that equate a prorated value of the property. Separate ADU’s suit a variety of demographic groups including newlyweds, young professionals, empty nesters, retirees, and are a very flexible, valuable and enduring component to the fabric of a neighborhood and can be included in any project planning. Additionally, allowing ADU’s is one way that communities can provide more affordable housing opportunities without the necessity of local government expenditures or subsidies. 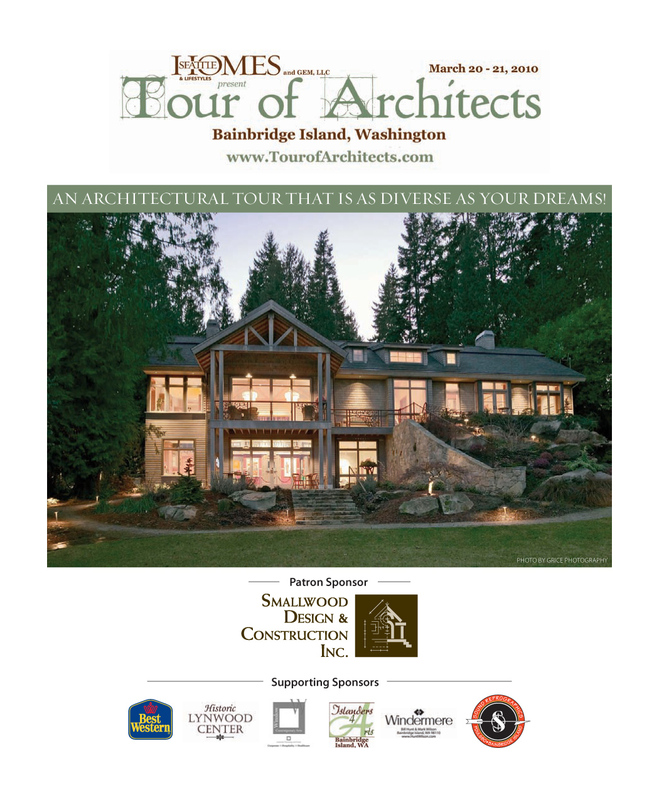 Note: Peter’s work will by on the Bainbridge Island Tour of Architects on March 20th and 21st. For more info on the tour see my last post or visit Tour of Architects. AN ARCHITECTURAL TOUR THAT IS AS DIVERSE AS YOUR DREAMS!